You’ve read about my challenges with Norah, the five year old, this year. I really had few troubles with her until Cedar was born. She didn’t even have terrible twos or tantrums that could not be quickly calmed. I was so proud of my mad parenting skills. But since no one chose to clue me in that five years old kids have tantrums, I was quite unprepared for the big feelings in both of us. First, let me remind you of the cool, amazing traits Norah possesses. She knows what she wants. In detail. Like her birthday cake. She described it to the caterer in exact detail. And you should hear her talk with the pedicure person (“now will this color show up on this color?”). Last time we got a pedicure, I was shocked when she asked the lady for a bottled water. Then the lady asked if I wanted a glass of wine. I had no idea they served complimentary drinks! Norah doesn’t miss a thing. 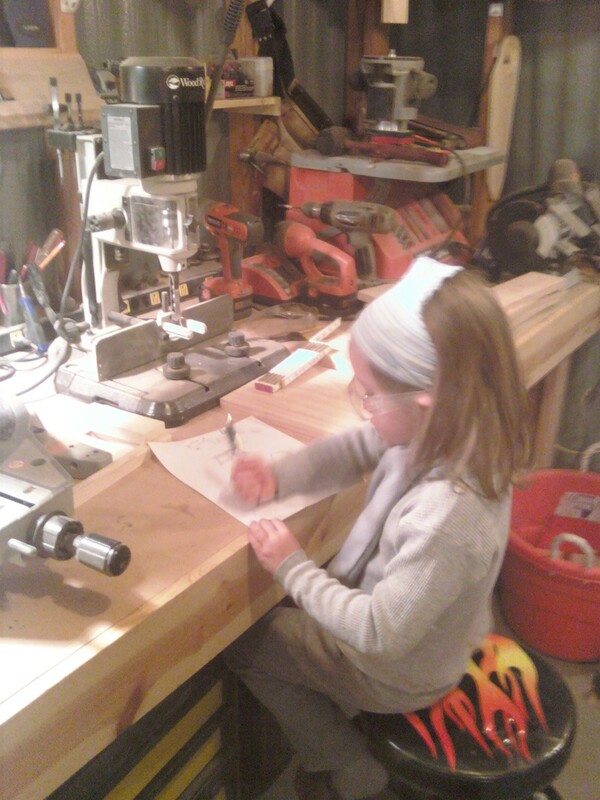 Here she is designing the bird house she built. She has incredible self-discipline. She will not, under any circumstance, drink her hot chocolate or eat her popcorn until the movie begins. It doesn’t matter how long the previews are. And because I told her we don’t drink soda, she applies it to every occasion. Even when I’m not there. Even if it is a birthday party and all the other kids are drinking it. I never meant for my rule to be, well, a rule at all. She notices everything. What type of cars people drive, if portions are not equally distributed, clothing her friends wear, facial expressions, verbal nuances, when the grass needs to be cut, the dust on the ceiling fans, the neighbors’ comings and goings. The exact details of a yellow jacket. She isn’t afraid of anyone. Imaginary lions hiding in the house, yes. Possible tornadoes brewing, absolutely. Vomiting, terrified. But people? No. No one has told her about age limitations either. 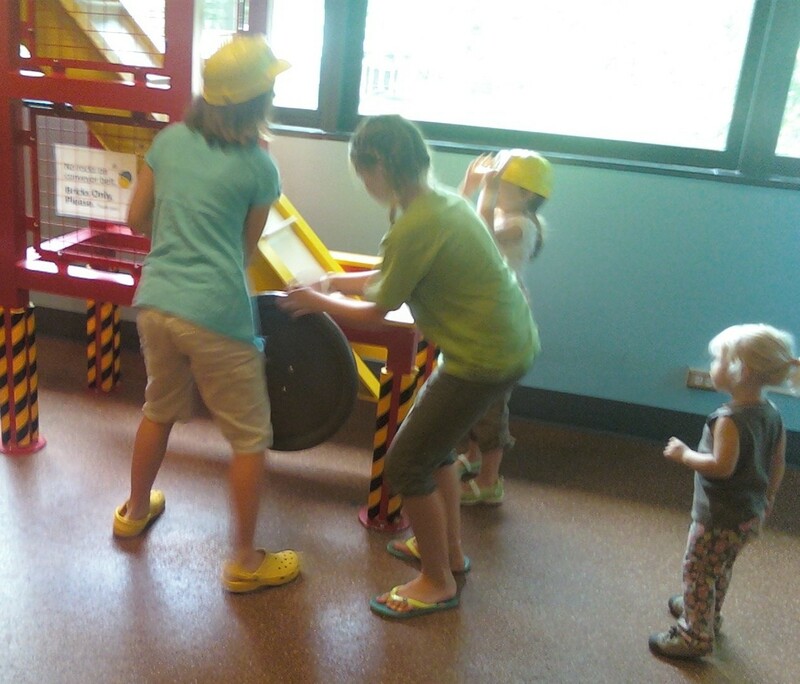 Here she is at the children’s museum where she donned a hard hat and called herself the “factory director.” She had a crew of four older kids (11-ish?) rushing to make quota. Cedar was the only one who didn’t obey her. You can probably already see that these amazing traits are easily linked to our challenges. Precocious and spirited child (who flat out told me she was smarter than me) with unbendable rules and high expectations for what she wants. And who doesn’t let anything slide. It manifests as anger. Big ole giant pot of anger bubbling over. Yelling and slamming and stomping and (yes) spitting and (once) kicking. Have I ever mentioned that before I had kids, I taught Anger Management to adults as part of my job? Bwaa-haa-haa. Yeah. How is that working out for me? Posted in Parenting and tagged anger in children, positive discipline. Bookmark the permalink. She’s brilliant! She’ll make a remarkable adult. I am looking forward to seeing what your tools are. I think we’ve already crossed the threshold into the strong willed fives.